South Africa – Official Blog of Cartan Tours Inc.
People come from all over the globe to hike Spain’s Santiago Trail, which if walked in its entirety, takes about a month to do. The trail starts out pretty remote and rugged, and then gets more civilized as the days pass. Unlike a lot of other trails I have hiked, the Santiago Trail offers hikers cafes, restaurants, and accommodations along the way. Pilgrims or walkers, can choose from sleeping in a tent or sleeping in a 4-star hotel. There are also hostels, B&Bs, and mid-range hotels along the way. When I walked the trail I mostly stayed in the Pilgrim hostels and then mixed it up sometimes with a stay in a hotel. 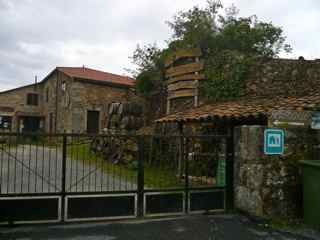 One that I thought was especially beautiful (though I did not stay there) was Mercadoiro. Both hotel and hostel, one of the 24 beds at Mercadoiro go for 9 euros a night. They also have two private rooms available. As you can tell, this is a small place and I imagine that it fills up fast during the summer when the Trail is at its peek. Mercadoiro also has a lovely restaurant with an outdoor terrace surrounded by potted plants and the sound of birdsong. 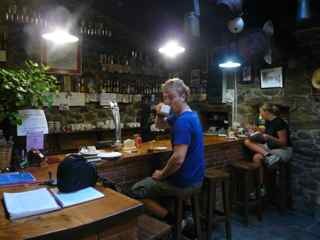 They offer a daily special at the restaurant for about 8 Euros and can also arrange massages for hikers with sore feet. Of all the hostels I saw along the trail, this was one of the most welcoming. In two words: ‘Good Vibrations’. 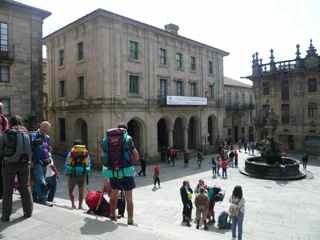 Galicia’s Santiago de Compostela is the end point for El Camino de Santiago, a trail that begins on the Spanish-French border and crosses northern Spain. In the past, El Camino de Santiago was a pilgrimage route, and the devout from all over Europe tread its soil for many months in order to arrive at the Cathedral in Santiago de Compostela and pay their respects to the relics of Santiago. As you can imagine, walking in bad shoes or even barefoot in the elements for many months takes its toll on the body. Once pilgrims arrived in Santiago, they often needed medical attention, and so a large hospital was built near the Cathedral to treat new arrivals. This former hospital is now a luxury five-star Parador, and perhaps the best place to stay in Santiago de Compostela, whether you are a pilgrim or otherwise. I did not walk the whole of the Camino de Santiago (it is still very popular for religious and non-religious hikers), but I walked a week’s worth of it. 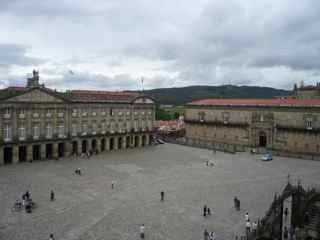 Upon arrival I would have loved to have stayed in Parador Santiago de Compostela, which looks right out onto the Cathedral’s main plaza. I stayed a few days in the city, and many times had coffee on the Parador’s terrace, watching pilgrims arriving after many weeks of walking. It’s very entertaining and the Cathedral is not too bad to look at either. The Parador was built in 1499, and according to its website, is one of the oldest hotels in the world….this could be because it also acted in the past as a hostel for the pilgrims. If you like a bit of history and religion along with your accommodations, then this is the place to stay. Santiago de Compostela is often overlooked by those visiting Spain, and this is too bad, because it is one of the country’s finest cities. See more on Parador Santiago de Compostela online.